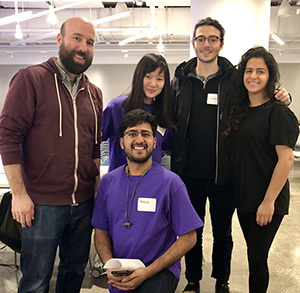 Nearly 90 engineering students from several colleges in the New York City area participated in a 24-hour hackathon hosted at the MakerSpace student design shop at New York University Tandon School of Engineering in Brooklyn, N.Y., earlier this month. The spirited event, “ASME EFx™ NYU: MakerHack,” was the first EFx event to be held in the United States. Launched last year, EFx events are smaller-scale versions of the ASME Engineering Festivals™ (E-Fests) that can be easily staged by local colleges and universities throughout the world. During the hackathon, which was held March 9 and 10 and sponsored by NYU and Siemens, 18 teams worked through the night developing unique solutions to a problem confronting the Brooklyn neighborhood dubbed Down Under the Manhattan Bridge Overpass (DUMBO). In the very near future, a mammoth, five-year $95 million construction project to restore the neighborhood’s famed cobblestone streets and replace the infrastructure underneath will commence, subjecting the area’s business owners, residents and tourists to obstructed streets, sidewalk closures and a range of other construction-related headaches. 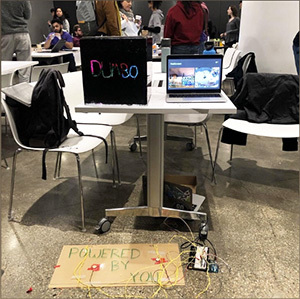 “DUMBO Powered by You,” which was the winning entry at the MakerHack event in Brooklyn earlier this month, employed kinetic energy from panels implanted in the sidewalk to power interactive displays intended to guide people through a construction zone to businesses. The teams taking part in the upbeat, all-night MakerHack were instructed to develop a prototype of a delivery system that would minimize the impact of the multi-year project by keeping tourists and residents informed regarding the progress of construction in the various DUMBO districts and by driving foot traffic to the neighborhood’s local businesses. At the end of the EFx MakerHack, which was attended by ASME Executive Director/CEO Tom Costabile and a number of other ASME staff and volunteers, three teams were singled out for their innovative solutions to the challenges posed by the renovation in DUMBO. The competition’s $3,500 top prize went to a five-member team of students from NYU for their entry, “DUMBO Powered by You,” which proposed that interactive displays powered by kinetic energy collected from panels embedded in the sidewalk could guide people through the construction scaffolding to shops that were open for business that day. A four-member team from NYU placed second in the competition and received $1,500 for their concept, “Twitter Plant,” which incorporated interactive art exhibits and an augmented reality smart phone app that would provide information about businesses that were open in the area, as well as artificial plants that would tweet passersby when they needed to be watered — and hopefully encourage traffic to businesses within the construction zone. (Left to right) Chris Martin, director of operations and community development for the DUMBO BID, with members of the second-place team Rahul Ashleigh from NYU (foreground), and Rena Otake, John Tronolone and Karen Yehoshua of Cooper Union. Three NYU students and a student from New York City College of Technology (City Tech) took home the $500 third prize for their entry, “DUMBO EZ Alerts,” a comprehensive software solution for informing residents and tourists of DUMBO about the street closures, utility outages and other various changes scheduled to occur in their neighborhood. 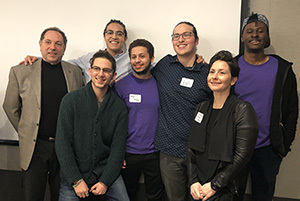 In addition to the cash prize, the winning team from NYU is currently in talks with members of the DUMBO Improvement District (BID) team, who proposed the challenge for the MakerHack competition, about the possible implementation of “DUMBO Powered by You” when the restoration project begins. All three teams also have the opportunity to submit their ideas to the city for further consideration. 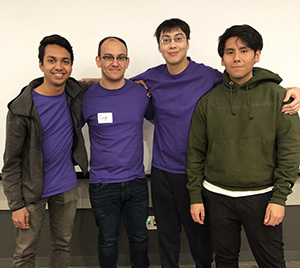 (Left to right) Members of the “DUMBO EZ Alerts” team Md Abedin of NYU, Diego Curatolo of City Tech, Enson Chen of NYU and Cesar Lema of NYU. The team placed third at the EFx event in Brooklyn. 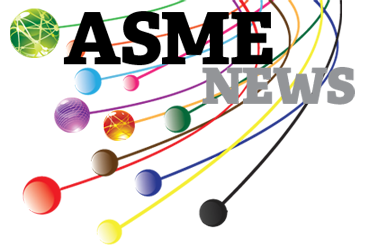 For more information on ASME Engineering Festivals and ASME E-Fest events, visit https://efests.asme.org. For information on hosting an EFx, contact Kristen Leoce at leocek@asme.org.